Monday, April 15, is a food-focused DIY night. It’ll be pretty egg-citing! (Hint. Hint.) This is adulting made fun. And colorful. And tasty. Later that week, on April 18 is Thursday Game Night. Take the challenge and see if you and your team can conquer our Escape Room! Food and fun for all. Prizes for the ultimate victors. Join us Thursday evening, April 25, at our Poetry Coffee House for hot drinks and cool creativity. Whether you are slam or silk, tingly or tough, come write, read, play, and discuss. Poetry is all about You expressing You! 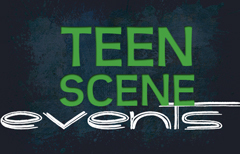 The Teen Scene has something going on every Monday and Thursday night. Pick up a calendar from the Teen Desk or see our online calendar to find out more!